Dalin really enjoys homework time. As soon as I tell the other kids it's time to do their homework he will run and get his paper and crayons, lay himself down on the floor and hum a little song while he colors away. But when he's done I guess he thinks everyone else should be done too. I've caught him a couple of times grabbing the girls homework papers off of the table and crumpling them up and trying to throw them in the trash. We've been lucky that nobody has lost anything so far. Yesterday he grabbed Kaylee's math paper and ran off and tried to flush it down the toilet. The little stinker! If you have ever heard any of Chris's childhood stories you would know that Dalin is completely Chris's kid! If you haven't heard the stories, ask Kaylee and Ashton I'm sure they would be happy to share. Chris has been going to school a couple of times a week and working alot of over time lately so I have had zero alone time. So for my birthday I told him I was going to go shopping and I would be gone for a very long time (it ended up being over four hours). It was so fantastic! I didn't even buy that much, but the fact that I was out by myself with no pressure to go home and relieve Chris was marvelous. I didn't have to convince any one to stay in the stroller or get any one out of the racks of clothes or chase anyone down the aisle or coerce good behavior with a bribe or listen to complaints of being at the store to long. It was as good as a spa day for me! I spent like an hour just trying things on, because I could! It made me happy all day. The kids cleaned their rooms for their present to me which was what I really wanted. 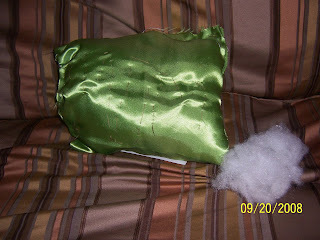 The girls also gave me a pillow that they made themselves, and Aiden gave me a home made rain cloud made out of cotton batting filled with water. I also got a lot of birthday wishes from my family as well. We went to dinner and had Cold Stone ice cream (my favorite) instead of cake. It was a really great day and just what I needed. I know all I do is talk about my kids, but really they are more interesting than I am. Here are some of the tidbits from the Edwards abode. Kaylee, Ashton and I were shopping one day and Kaylee kept pushing all of the clothes back on the rack. When I asked her to stop she said, "I'm doing the store a favor. When I push the stuff back it looks like there isn't as much and people will think they need to hurry and buy it before it's all gone." I love when I get to hear her thought processes. This is from about four years ago. I found it when I was going through some old e-mails and I didn't want to forget about it again. It just makes me smile. One morning when Ashton was three I was telling her to hurry and finish her breakfast because we had things to do. Her response, "What things, like sing, laugh, dance, play." Yes those are things we should all do. Okay this one I actually wrote about in another post last year, but just the thought of it makes me chuckle so I will share again. I was in charge of our primary program last year, so I was sitting on the stand to help any one who might need it. As the program was progressing Aiden came up to me to tell me something I couldn't understand, so I quickly shooed him back to his seat. Minutes later he came up to me again whispering what I'm sure he thought was important, but I still couldn't understand what he was saying so I sent him back to his seat again. He started crying a little and I thought it was because I had sent him back to his seat. He came back a third time and I finally understood him. He said, "You told me you would make me some toast before we came to church and you never did!" That one still cracks me up. 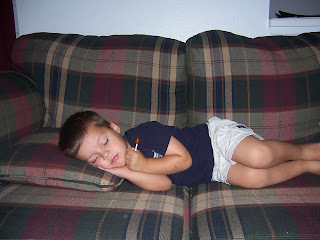 Last week while trying to get the kids ready for school and out the door I was feeling very frustrated. On my way out to the car I said, "You guys need to hurry up, you are going to make my head explode!" I then picked up Dalin and headed for the car. He kept looking at my head then told me, "No it not. Your head not splode." Too funny! Last but not least, my nephew Jayden was staying with us this past weekend and he is a little on the skinny side (that boy is always on the go, I wish I had his metabolism!). He was having dinner and he didn't want to eat very much and I asked if he remembered that we talked about how he needs to get some meat on his bones. He turned to me and said, "What about you Kristen, you need get some meat for your bones!" Oh how I wish that was the case kiddo! 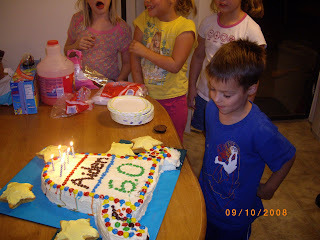 In honor of our favorite six year old here are a few of our favorite pictures of Aiden. 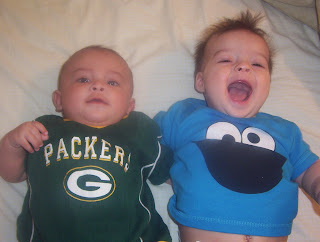 I love this one because Aiden's expression is the same as Cookie Monster's. Before and after. 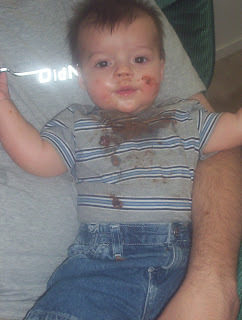 This is what happens when I leave Chris alone with the babies. Check out the water action on this one! Sound asleep with sucker still in hand. Aiden loves to take pictures of everything, but his favorite subject is himself. We have plenty of close-ups of this boy. 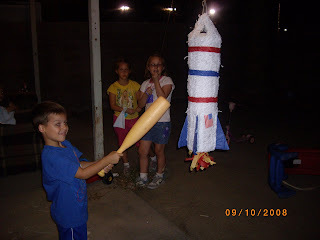 Rocket pinata and cake the day before his birthday. The cake says "Aiden 6.0" can you tell his dad is a computer geek? 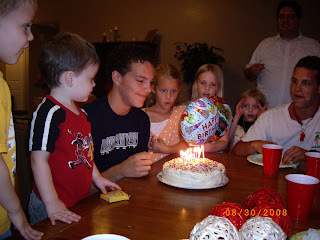 We had a family party the day before his actual birthday because there was a school fund raising night at Chuck E. Cheese and for the sake of the parents I didn't want to ask everyone to come to a building full to capacity of little kids. I seriously think the fundraiser nights are the main reason Aiden even wanted to go to kindergarten. He was so excited that his first one was on his birthday. I forgot to bring my camera so I didn't get any pictures from his birthday day, but they didn't sit still for more than a couple of seconds so it didn't really matter. A happy coincidence was that my brother Brandon was in town for last night on his way home from a job interview in Arizona so he was able to come to the party. Happy birthday Aiden, we sure love you! 1. I don't really feel like I have a lot of talents, so when something I do turns out well (i.e. sewing projects, cakes etc.) I am genuinely surprised. I would love to take some cake decorating and sewing classes to actually have some technique. 2. My brain kind of freezes when I have to talk to most people, so when I have to make phone calls I would much rather talk to a machine than a person. Then I don't have to start a conversation. 3. I was on the Family Feud with two of my brothers, my sister and sister-in-law. I was pregnant with Ashton at the time, but she was four month old before it finally aired. Oh yeah, we won! 5. I watch made for TV movies more often than I should. I am always disappointed by how dumb and predictable they are, but if I start watching one I can't stop. The same thing goes for teen shows, you know like "Hannah Montana" or "Life with Derek", 'I'm just sucked in. So there you have it, not very interesting I know. I'm not going to tag anyone, but if you want a reason to tell people about yourself, you can tell people that I tagged you. 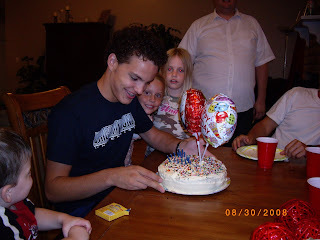 Yesterday my baby brother turned seventeen! Austin was born when I was a freshman in high school and now he is in his senior year. He was just a little older than Aiden is now when Chris and I got married. Luckily we have lived close enough to watch him grow up. He is a fantastic uncle to all of his nieces and nephews, and he puts up with a lot from his older brothers and sisters. Happy Birthday Austin, we love you! My parents were out of town for his birthday, so here are a couple of pictures of the birthday boy on his birthday. What happens when you put fire close to a mylar balloon? It pops! I think this is a picture of the popping action, just not the balloon you can see.